Last year I attended QED, a three-day scepticism and pop-science conference held in Manchester. There I saw some truly entertaining and thought-provoking talks given by people who are on the front line of science and scepticism outreach. The pamphlet was an interesting read, but I was expecting to see a series of arguments giving evidence as to why the creationism hypothesis is plausible, but that’s not what I found. Instead, I was treated to a 40-page attack on the theory of evolution written by a person who, rather embarrassingly, does not understand the theory of evolution. They seem to be under the misconception that evolution was always working towards what we see at this very moment in time. Here are some of my favourite examples from the pamphlet for your enjoyment. I personally find the idea of creationists fascinating. The idea that in a world where virtually the entirety of mankind’s knowledge can be accessed by the phone in your pocket, there are still people who believe in this crap boggles my mind. 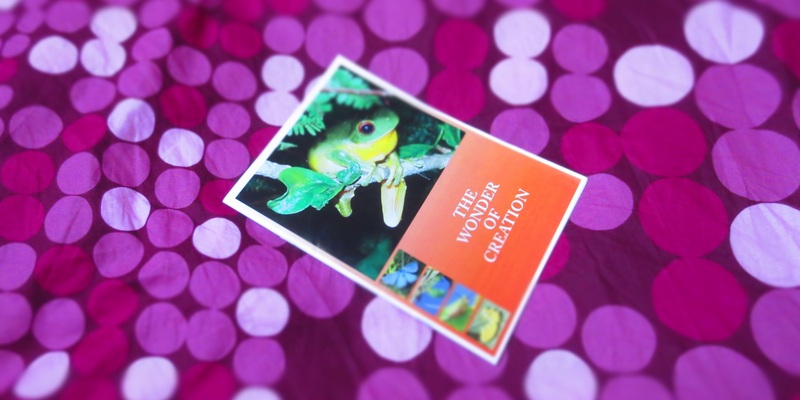 This little booklet has taken its place on my ever-expanding bookshelf of woo and I hope you have found these snippets in this blog as enjoyable as I did.